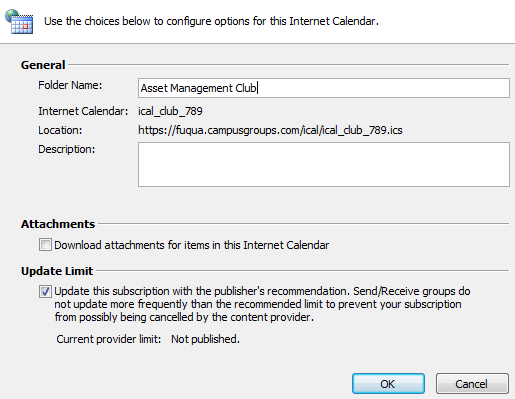 Export the campusgroups.com calendars to a number of "ICS" supported calendars including Google Calendar, Outlook, iCal, etc. The CampusGroups calendars feeds are updated every time an event is added or updated. Please sign in to see your Favorite Events ICS feed. Starring a group calendar will add all its events to your Personal Feed (see above). If you are a member of the group, the feed will contain public AND members-only events. If you are an officer of the group, the feed will contain ALL upcoming events listed in your manage section. View your CampusGroups events in your personal calendar (i.e. Outlook, Google Calendar, iCal, iPhone Agenda, Android, etc). 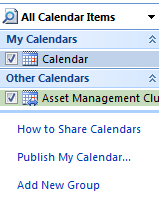 When a group modifies an event, it is automatically updated in your personal calendar. Receive event reminders (right now, this can only be achieved by subscribing from your iPhone/iPad). Why should you star events in CampusGroups? Save time - When you star an event in CampusGroups, it is automatically added to your personal calendar in 1 click. Customize your list of events - As opposed to the Group Calendar Feeds, your Favorite Events feed allows you to select the events you are interested in, and to only have these events added to your calendar. Know when changes happen - We notify you when an event you starred was modified or cancelled. We recommended that you subscribe to your CampusGroups ICS feeds from your Outlook Desktop. Any change made to an event will be automatically and instantaneously updated on your calendar. You will not receive any event reminders unless you manually copy your events from your ICS subscription into you personal calendar. 1) Click on the Copy Link link and copy the ICS URL. 2) In Outlook, on the Tools menu, click Account Settings. 3) On the Internet Calendars tab, click New. 4) Paste the URL you copied in step 3. Click Add. 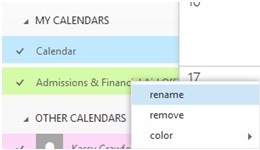 5) In the Folder Name box, type the name of the calendar as you want it to appear in Outlook, and then click OK.
We recommended that you subscribe to your CampusGroups ICS feeds from your Apple iCal app on your Mac. Any change made to an event will be automatically and instantaneously updated on your calendar. 1) Copy the iCalLink URL under the "ICS Feeds" tab of this popup. 2) In iCal, on the Files menu, click on New Calendar Subscription. 3) Paste the URL you copied in step 1. Click Subscribe. Your ICS subscriptions will appear in your Outlook.com account and will also appear on your mobile as long as you have connected your Mobile with your Outlook account. Your ICS subscription will only be updated every 3 hours and will not allow you to receive reminders. 1) Click on the Link link and copy the ICS URL for the calendar you wish to add. 2) Open a new tab in your browser and go to outlook.com for macaulay and sign in with your NetID and password. 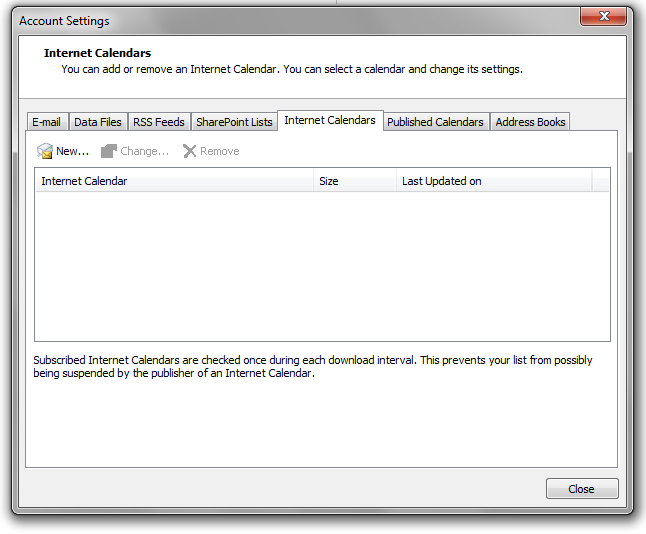 5) Paste the calendar URL into the Internet calendar: box and click the open button. Your ICS subscriptions will appear in your Google Calendar account and will also appear on your mobile as long as you have connected your Mobile with your Google account. Your ICS subscription will only be updated every 12 hours and will not allow you to receive reminders. This is a known issue which Google has not yet decided to resolve. 1) Click on the Google Calendar link of the group which calendar you want to export. This is due to a conflict between Google Calendar and your browser. You can try to update your browser, or even better for this widget, use Google Chrome. Or follow the second method. 1) Copy the link of the "Cannot add" message, then click OK.
2) Go to Google Calendar. Click on the triangle next to Add in the "Other Calendars" section (bottom left of the screen) and select Add by URL. 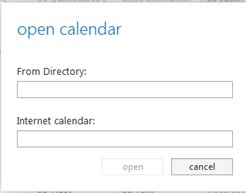 3) A window will pop up asking for the URL of the calendar. Paste the link you copied on step 2 and click on Add Calendar. 4) The events of the selected group will show up on your calendar and they will get updated just as they are on CampusGroups. If this happens to you, just repeat instantly Steps 4 and 5 and you should be fine. This is a great way to subscribe to any CampusGroups ICS feeds from your iPhone/iPad, and to also get Reminders/Alerts 15mn before the event. 1) Adding a "Star" to an event in CampusGroups, will automatically and instantaneously add this event into your mobile calendar and reminder. 2) Modifications to any of your events (i.e. date/time, location, etc), will be automatically replicated on your mobile calendar. 3) You will also be notified in CampusGroups when changes to event occur. 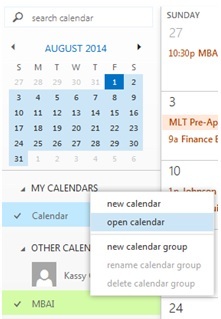 8) Open your Agenda App from the home screen of your device and click on Calendars. Make sure that you new ICS subscription is there and checked. You can select a color for your new subscription. You will receive a notification/alarm on your device 15 minutes before an event.